MPs have voted to reject a bid by nearly 100 rebel Tory MPs to stop foreign criminals using European human rights law to avoid deportation. If, as had been expected at one stage, Labour MPs had also abstained, the rebel amendment would have succeeded. In the event it was defeated by 241 to 97. BBC political editor Nick Robinson said David Cameron had "simply ordered his troops to retreat in the face of embarrassment" and the episode illustrated the difficulty the prime minister had with controlling his own backbenchers. There was confusion in the Commons as Mrs May sought to attack Mr Raab's amendment just as Downing Street was announcing that ministers were to abstain in the vote. Shadow home secretary Yvette Cooper accused the home secretary of being "scared of her own backbenchers", adding that the Immigration Bill has been a "car crash" for the government. She told Mrs May: "We know you opposed the amendment, because if you supported it you could have voted for it and it would have gone through. "But you didn't. You sat on your hands because you were scared. What kind of home secretary is that? What kind of government is this?" In a statement, UKIP's head of policy Tim Aker said Mr Cameron had "lost the plot", adding the only solution was to "leave the EU and leave the ECHR to take back control of these legal issues". Downing Street said that Mr Cameron agreed with the aims of the rebels, but had told ministers to abstain because of fears that the actual measure being proposed could be illegal. Mrs May had been accused of trying to buy off rebels keen to see a tougher line on immigration with her plan to strip some foreign-born terror suspects of their citizenship even if it left them stateless. But she insisted it had been planned for some time - a point confirmed by Deputy Prime Minister Nick Clegg, who said the move was "justifiable". She also hit back at claims by Lib Dem MP Sarah Teather that she was seeking a "blank cheque" to rob citizens of their rights, arguing that home secretaries would be able to render someone stateless only in "very, very specific and limited circumstances" and in strict accordance with the UK's international obligations. It would not apply to British citizens but could see foreigners who have become naturalised citizens whose conduct is deemed "seriously prejudicial" lose their nationality. 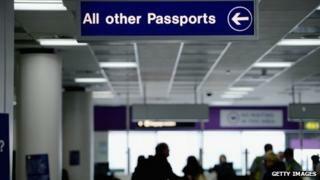 People with dual nationality can already lose their British passports. The main thrust of the Immigration Bill is being supported by Labour and other parties in the Commons. Make some temporary migrants - such as students - pay a £200-a-year levy towards the cost of NHS services.